This Dictionary provides over 135,000 entries and nearly 185,000 equivalents covering all areas of law, plus relevant terms in related spheres of expertise. 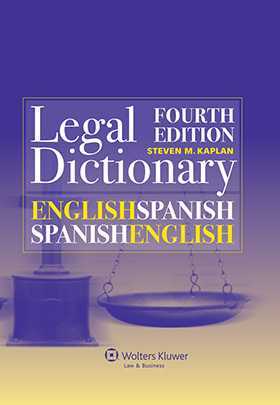 It is the Dictionary that lawyers, educators, students, translators, and in general those working in both languages in law and associated fields have been trusting since the First Edition was published in 1993. In order to prepare this Fourth Edition, the entire Third Edition was comprehensively revised and updated, plus over 35,000 new terms were added. Because of its straightforward and naturally intuitive format, there are no special rules or indications for using this Dictionary. Users simply look up any desired word or phrase, get the equivalent, and return to whatever was being worked on. The general presentation of the Dictionary is elegant, easy on the eyes, and facilitates finding the desired terms and equivalents with the least time and effort.